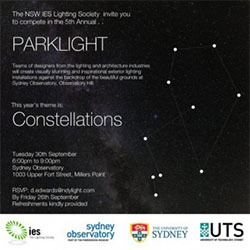 pH+ took part in Parklight 2014, a lighting competition at Sydney Observatory, organised by the NSW Lighting Society, in collaboration with the University of Sydney and UTS. This years theme was ‘Constellations’ with teams of designers invited to create in-situ lighting installations in the observatory’s grounds at night. An enjoyable evening, in a beautiful setting, concluded with a close second place to the well deserved winners. Thanks to all the organisers and sponsors for an enjoyable event.